Two men have walked away unscathed from a devastating crash outside McDonald's in Chorley town centre. The driver and his passenger, both male and in their 20s, escaped unharmed after a BMW hit railings and overturned on the A6 near Chorley Interchange. Emergency services rushed to the scene at 8.53pm on Monday (February 4) after members of the public witnessed the driver lose control of the vehicle before it crashed in Clifford Street, off the A6. 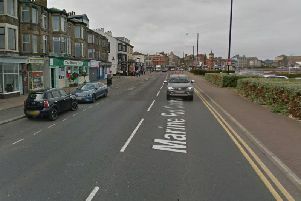 Lancashire Police said the incident was a "damage only collision" and would not confirm whether anyone has been arrested in connection with the crash. When queried, they declined to comment further on the shocking incident. Eyewitnesses reported seeing the BMW leave McDonald's before losing control at a nearby roundabout, close to the Inspire Youth Zone. No other vehicles were involved in the collision. Jaime Jones, from Chorley, watched as the car turned sharply at the roundabout, overturned and skidded into metal railings. The crash happened in Clifford Street, Chorley, close to the new Market Walk development. Ms Jones said: "Me and my partner witnessed this car heading down the A6 towards the roundabout near Inspire Youth Zone where it lost control and flipped onto the other side of the carriageway. "It slid across the road and ended up pointing in the opposite direction and taking out the railings in the process. "I don't know how they got out alive." A spokesman for Lancashire Fire and Rescue Service said the written-off car was left "smoking", but no-one had been injured. "At 8.53pm two fire engines from Chorley and Bamber Bridge attended a vehicle on Clifford Street, Chorley which had overturned and was smoking", said a spokesman. "Crews used one hose reel and made the scene safe. Crews were in attendance for fifteen minutes. "There were no known casualties." Shaun Walton, Group Manager with Lancashire Fire and Rescue Service added: "Driver and pedestrians extremely lucky to walk away from this RTC near McDonalds in Chorley.